Building a strong, productive analytics shop takes careful planning, methodical steps and smart use of resources and data. 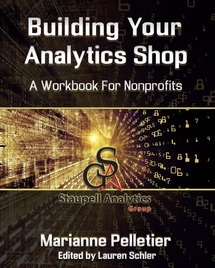 This workbook walks you through how to structure your office for a successful, data-driven program. The workbook was released on March 1, 2016 at the cost of $49.95. Read a review of the book by Jennifer Filla of Prospect Research Institute - here. Or read what Helen Brown of the Helen Brown Group says - here.